BRÉARD, JACQUES-MICHEL, controller of the Marine, merchant, and member of the Conseil Supérieur of Quebec; baptized 7 Dec. 1711 at Rochefort, France, son of Jacques Bréard, a notary and cashier in the Marine, and Marie-Anne Marcellin; d. 22 March 1775 and buried in the parish church of Saint-Mandé-sur-Brédoire (dept of Charente-Maritime), France. Jacques-Michel Bréard joined the Marine as a cadet in March 1730 and became a writer in December. It is known that he made a voyage in 1731–32 to Martinique and Saint-Domingue (Hispaniola); otherwise he had various port duties at Rochefort. On 1 Jan. 1748 he was named controller of the Marine at Quebec with supervision over finances, stores, construction, and recruiting, and he arrived at Quebec on 26 August with the new intendant, Bigot, on the Zéphyr. His main duty was to keep a watch on all Marine property and funds by verifying every transaction of the intendant, of the agents of the treasurers general of the Marine and Colonies (such as Jacques Imbert* and Alexandre-Robert Hillaire de La Rochette), and of others in a set of duplicate records which he was to keep for this purpose. The controller was all the more necessary because the agents at Quebec were not royal officials but salaried employees of the treasurers general for the Marine and Colonies, who managed naval and colonial funds in what amounted to a private banking system. Bréard, like most Bourbon officials, did not consider himself morally bound to work only for the crown in return for his salary, which even in 1756 was a meagre 1,800 livres, and he evidently spent much of his time in more profitable ways. From the very beginning of his tour of duty in Canada, he held a one-fifth interest in a transatlantic trading company formed with Bigot and a Jewish firm of Bordeaux, David Gradis et Fils, in a contract of 10 July 1748 renewed in 1755. The partners shared in the profits of at least one annual shipment of about 300 tons of goods from Bordeaux to Quebec; and Bréard and Bigot fitted out some smaller vessels for trade with the West Indies, as the contract suggested they might. Bréard in fact had several schooners built at Quebec for the Martinique trade. According to Jean-Victor Varin de La Marre, between 1755 and 1757 Bréard was also in partnership with Michel-Jean-Hugues Péan, Bigot, and Varin himself. 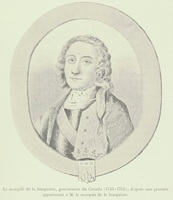 Meanwhile, on 1 May 1749 he became a member of the Conseil Supérieur with a stipend of 450 livres annually, and in the same year he acquired a one-fifth interest in a seal and porpoise fishery on the Labrador coast at Chateau Bay through a partnership with Jean-François Gaultier*, the proprietor of the concession, and Charles-François Tarieu de La Naudière. On 5 Nov. 1748 Bréard and Guillaume Estèbe had been granted a nine-year fishing and trading concession on the Rivière Thekaapoin, between the concessions formerly granted to Jean-Baptiste Pommereau* and François Margane* de Lavaltrie. When this property proved useless for fishing because of the way the tides rose and fell among the islands there, Bréard was able to win the concession of Saint-Modet, previously exploited by Pierre Constantin*, on 6 April 1751. In Canada, Bréard went into the business of selling trading licences for western posts under the patronage of the governor, La Jonquière [Taffanel*], notably the posts at Detroit, which proved so profitable that he made a total of 1,100,000 livres. The capital funds needed he obtained from acquaintances in France and the management of the business he entrusted to Estèbe. Bréard’s brother, Marcellin-Nicolas (1714–1785), had become a writer in the Marine, then a minor supplier of wood to the Marine, and in April 1758 the agent at Rochefort for the treasurers general of the Colonies, a post he was to hold until 1768. We do not know whether this brother was directly involved in Bréard’s business at Quebec but he was well placed to be. He had to settle all official accounts for the colonies at Rochefort, paying out, for instance, 144,969 livres for shipments to Canada in 1760 on three Bordeaux ships, the Machault, the Fidélité, and the Marquis de Malauze. In this post, Marcellin-Nicolas increased his fortune from about 40,000 livres to about half a million and as his appointment was founded on a bond of guarantee for 60,000 livres posted by Jacques-Michel in 1758, we may reasonably surmise that the two brothers were in business together. These suspicions are in no way reduced by the discovery that the Marine intendant at Rochefort, Charles-Claude de Ruis-Embito de La Chesnardière, was Marcellin-Nicolas’s patron, instrumental in securing the post of treasurers’ agent. Having made a fortune at Quebec, Jacques-Michel Bréard became homesick for the gentle climate and civilized order of western France where, by notarial contract of 7 Feb. 1753, he had bought a manor house called Les Portes in the parish of Saint-Mandé-sur-Brédoire on the borders of Poitou and Saintonge. Besides he felt uncomfortable at Quebec since complaints about his business dealings had been sent to the minister at Versailles. Since 1752 he had, it was said, been suffering from a “maladie de langueur et d’Elizie” and with the permission of his superiors at Quebec he sailed away on 29 Oct. 1755. He arrived at La Rochelle on 19 December. There he learned that the day before he left Quebec the Aimable Rose of Honfleur carrying all his belongings back to France in seven large packing cases had been seized and taken to Portsmouth as a prize. He may have recovered his papers for at his death he possessed a set of accounts for every year he had been in Canada. On 9 Feb. 1756 a ministerial order to return to Quebec prompted Bréard to arrange with Abraham Gradis for a shipment of goods to sell in Canada; but on doctor’s orders he was allowed to remain in France at last and was posted to Marennes on 15 Aug. 1757 as commissary for naval conscription. Already on 18 May 1756 he had bought a royal magistrate’s office with the title of treasurer of France and made other investments, especially in private loans. Bréard and his family were now able to indulge their social ambitions. He had married Marie Chasseriau, daughter of a minor nobleman of Saintonge, in October 1741, and they had two sons who became minor noblemen themselves. The elder, Jean-Jacques Bréard, born at Quebec on 11 Oct. 1751, became a councillor in the fiscal subdivision of Marennes, then mayor of the town, and went on to play a part in the French revolution as a member of the Convention and the Committee of Public Safety with a special interest in naval business. There were two daughters, also born at Quebec, who married poor noblemen and for the first of these marriages Jacques-Michel Bréard put up a dowry of no less than 80,000 livres. Without the disasters of the affaire du Canada the Bréard family might have blossomed like so many other French families with similar beginnings. Suddenly, on 24 April 1762, orders were issued for Bréard’s arrest and he was imprisoned in the Bastille with the other officials from Canada. He and they had often been denounced for their rapacious business dealings in Canada since 1748 and might well have been arrested earlier. But present-day high standards of conduct for public servants date from the 19th century; the 18th century saw nothing wrong with a royal official carrying on a private business on the side so long as it did not interfere with the royal service or harm the interests of the crown or the legal rights of others. Bréard, like Bigot and Joseph-Michel Cadet, was a scapegoat for the crown’s loss of Canada and its repudiation of colonial and naval debts. The trials were nicely timed to draw public anger onto the heads of these officials. In the general judgment of 10 Dec. 1763 Bréard was banished from Paris for nine years and ordered to pay a fine of 500 livres and a restitution to the crown of 300,000 livres. Bréard had indeed cheated the crown and the public, but no more so than was usual in Bourbon France. The political motives underlying his trial would be hard to deny in view of the royal lettres de réhabilitation which cleared his name on 27 Dec. 1771. Long before then Bréard had retired to the life of a modest country gentleman living on his rents and annuities at his seigneury of Les Portes, with a few servants and tenants, horses and livestock of every kind, vineyards, and the acquaintanceship of a local circle of small office-holders, army officers, and minor noblemen. He had a library with books on many subjects, especially history, and also the works of Rousseau, Voltaire, Pascal, Bossuet, and the French classical dramatists. His little manor house, much altered, was still in the hands of his descendants in 1971 when their métayer was pleased to show its thick walls and two decorated fireplaces. The cottagers were still talking of the family’s ancient connection with Canada. AD, Charente-Maritime (La Rochelle), État civil, Saint-Mandé-sur-Brédoire, 24 mars 1775; Minutes Audouin (Aulnay), 17 juin 1775 (Bréard’s inventory after death) [I wish to thank M. and Mme Lemercier, notaries at Aulnay, for generously helping me and for responding to my suggestion that they deposit their old minutes at the Archives départementales at La Rochelle. j.f.b. ]; Minutes Bietry (Saint-Just), 6 oct. 1741 (Bréard’s marriage contract); Gironde (Bordeaux), Minutes Dufaut (Bordeaux), 28 juill. 1784. AN, T, 5901-4 (papers of Bréard’s brother and descendants); V1, 391 (concerning Bréard’s office as treasurer of France); Col., C11A, 98 (especially Bréard to the minister, 28 Oct. 1752); Marine, C7, 44 (dossier Bréard). PRO, HCA 32/162, Aimable Rose (including a bill of lading for Bréard’s property and other information). Docs. relating to Canadian currency during the French period (Shortt), II, 783–86. J. F. Bosher, “BRÉARD, JACQUES-MICHEL,” in Dictionary of Canadian Biography, vol. 4, University of Toronto/Université Laval, 2003–, accessed April 26, 2019, http://www.biographi.ca/en/bio/breard_jacques_michel_4E.html.